“Je Suis Charlie”: A Uniting or Dividing Theme? From the devastation of the January 7, 2015 attacks at the Paris offices of the satirical publication Charlie Hebdo, a new clarion call has emerged: “Je suis Charlie!” As Parisians took to the streets to protest the murder and devastation, a cartoonist penned the phrase, “Je suis Charlie,” meaning “I am Charlie,” to say that, “We are all Charlie,” standing vigil to protect the paper’s rights, and journalists’ rights to do their job and come home alive. There’s no denying that this has phrase taken off phenomenally via social media. But is this growing sentiment problematic? Looking at “Je suis Charlie” from a branding perspective, and also from a cultural perspective, it’s interesting to note that its commercialization also happened very quickly. Social movements, religious movements, and civil rights movements rely on the ability to spread word and get their themes out to the masses. “Je suis Charlie” has been a very powerful theme, and as it grew stronger, so did its controversy. For instance, the theme has, not surprisingly, been trademarked, but the people who are registering the trademark are various sorts, and you have to wonder what’s going to happen to the integrity of a theme when, for instance, someone has actually trademarked it in the laundry detergent category. It’s always interesting how opportunists hijack trending topics for financial gain. This is no unusual, especially now that social media exalts numerous phrases and themes at such a rapid pace. But, following the Paris attacks, “Je suis Charlie” was not the only phrase that was being spread on social media. There is the iconic picture of crowds taking to the square and holding up a letters that read, “Not afraid.” Those words were not focused on a particular right—the right to free speech, or the right to be able to draw the Prophet Muhammad — but were more about being able to unite everyone in our feelings and our passions, and our rights to live as we go about our daily lives. Is it possible that, in its lack of specificity, that this phrase “Not afraid” was more impactful? Charlie is, at the end of the day, a publication, a business, which did very well in its next issue. Would “Not afraid”—words that were less event-specific, and, arguably, longer-lasting, and a little bit more broad—be verbiage that would resonate with everyone, but would offend no one? 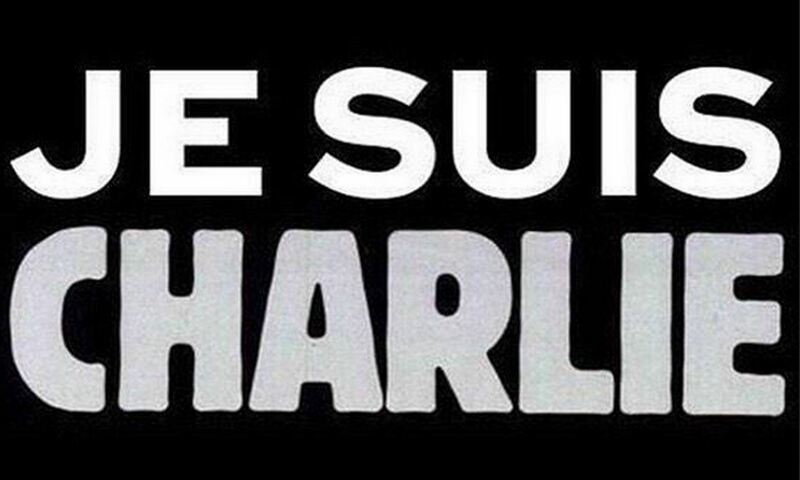 Or is the very specificity and emotional volatility of “Je suis Charlie” the point? Further, is it too easy to lose sight of the real emotional intent of any theme once it’s gotten into the hands of commercialization? “A conversation is what is needed– that is what creates movements. Movements get started with an incident, and then it’s the conversation that actually reshapes a society. It was when in the families, children came home and said, ‘Why are we segregated from black children?’ When conversations in the home begin, that’s when you see change in a society. So I think these kinds of moments and incidents are watershed moments that have a deeper societal impact ultimately. So from that perspective, I think it spurred something, and I’m seeing very positive things coming out of France right now,” Khan notes. Capturing the right dialog can be key to forward movement for these kinds of conversations. The conversation incited by the terrorist attacks in Paris are happening because, even if the hashtag were “We are not afraid,” the fact is, it still would likely have been construed one way or another as being anti-Muslim. Although impactful, complex issues and devastating incidents cannot be boiled down to a hashtag. One of the realities—and problems—with social media is the attempts to coin an entire movement with a single hashtag. Themes, tweets and memes can ignite the conversation, but the conversation itself is the key to taking it to the next, and meaningful level. Tynicka Battle is CEO and Founder of Tynicka Battle Digital. Liz Nickles is President of Black Label Brand Development and author of BrandStorm. Daisy Khan is Executive Director of the American Society for Muslim Advancement, a non-profit organization dedicated to building bridges between the Muslim community and general public through dialogues in faith, identity, culture, and arts.